Eat Your Carbs, They’re Good For You! You may think after all of the talk lately about carb reduction that you need to avoid eating carbohydrates. But the exact opposite is the case. The kinds of carbohydrates you get from fruits and vegetables are a necessary basis of your daily diet. Instead of helping you “pack on the pounds,” they actually help you to burn fat. They are also a major source of fuel for your body, especially your muscles, brain and nervous system. Carbs occur in two types: simple and complex. They are broken down into glucose, or blood sugar, which is metabolized by your body for energy. Glucose not immediately used by you is stored in your muscles as glycogen, but if your body has an excess of glycogen, it is converted into fat. However, because carbs prime your metabolism, you need them in order to burn fat. This is one of the major reasons you must not starve yourself and eat too few carbs. You must eat a good intake of complex carbs, such as those found in fruits and veggies. Simple carbs, such as those found in candies and sweets, and also fruit, are turned into glucose quickly. These are the kind which can add to your weight problem. Complex carbs, such as those found in brown rice, veggies, legumes (peas, beans and lentils), and whole grains breads and cereals are digested and thus used at a much slower rate, giving your body time to prime its metabolism. There are four calories in each and every gram of carbohydrate. Nutritionists say that 50% of your diet should consist of complex carbs. Simple carbs are high in calories but low in vitamins and minerals. These are the so-called “empty calories” that you find in sodas, deserts and other such sweets, and to some extent in fruits — especially fruit juices and fruit juice drinks. You should be getting your major carb intake from whole fruits, whole grains and vegetables. Good high carb veggies are peas, peppers, pumpkin, radishes, spinach, squash, succotash, sweet potatoes, tomatoes and turnips. Succotash, sweet potatoes and green cooked peas are the highest in carbs. You need several servings per day of complex carb foods such as these to maintain your energy levels and keep you from getting those “sluggish” feelings that make you feel sick and tired. By eating five or more servings of fruits and vegetables every day, you will be boosting your health through better carb consumption. The National Cancer Institute recommends that you have fruit juice — or better yet fresh fruit – every day for breakfast. You should have a fresh fruit or vegetable snack every day. You need to stock up on dried, frozen and canned fruits and veggies. You must make these foods visible and easy to access throughout your daily routine. And you have to “sample the delicious spectrum” when it comes to the many different colors and varieties of fruits and vegetables. You will get your “five a day” if you eat one cup of dark, leafy greens, one half cup of red tomatoes, one half cup of yellow peppers, six ounces of orange juice and one half cup of blueberries. This is only one example of how you can consume “five a day” of fruits and vegetables to keep your complex carb ratio up. Please notice this includes only one serving of fruit juice. Various nutrition experts state that you should eat whole, fresh fruits more often than drinking fruit juice, which keeps those simple sugars from adding to your weight problem. This is because simple sugars are more concentrated in fruit juices than in whole fruits. You should eat at least two cups of fruit a day, in a variety of fresh choices, such as one small banana, one large orange and one quarter cup of fresh or canned apricots or peaches. Also, eating fresh fruit adds more fiber to your diet and helps flush toxins from your system better than only drinking fruit juice does. You should also eat plenty of dark, leafy green veggies, which are among the best foods for you. Eat broccoli and kale, as well as mustard greens and spinach. Also, you should eat “orange” veggies such as carrots, sweet potatoes, pumpkin and winter squash. For peas and beans, among the best are pinto beans, kidney beans, black beans, garbanzo beans, split peas and lentils. Foods such as these are extremely healthy, low in fat, and terrific for raising your energy levels. Eating fruits and veggies will also greater lower your risk for cancer. 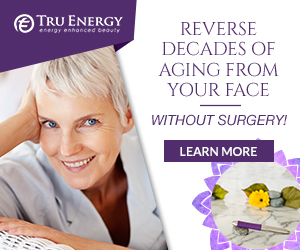 Researchers at the Human Nutrition Research Center on Aging at Tufts University have made “top ten” lists of the best antioxidant (anti-cancer) fruits and vegetables. 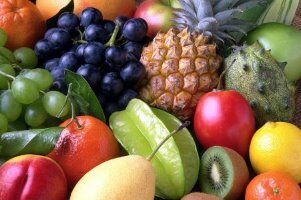 1) Fruits: prunes, raisins, blueberries, blackberries, strawberries, raspberries, plums, oranges, red grapes and cherries. 2) Veggies: kale, spinach, Brussels sprouts, alfalfa sprouts, broccoli, beets, red bell peppers, onions, corn and eggplant. 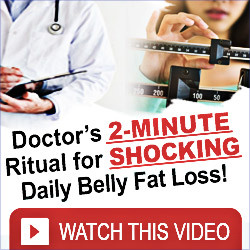 While the average American seldom gets as much as two servings of these good foods per day, nutrition experts say that five to seven servings a day need to become a staple of the ordinary American diet. You can easily sneak these into your family’s eating patterns. Try serving raw veggies at every meal, and take advantage of packaged, prepared veggies. Put veggies into your breakfast and lunch, and start each family dinner with a mixed green salad. Serve a salad entrée dish once per week, fill your spaghetti sauce with vegetables, and begin ordering a weekly pizza – with an extra serving of healthy vegetables. If we were to eat more veggies and fewer processed foods, we as a country would lose weight, clean out our clogged arteries, balance our blood sugar and shut down a large number of hospitals in the process. This would roughly solve America’s growing health and obesity problems – in a nutshell. 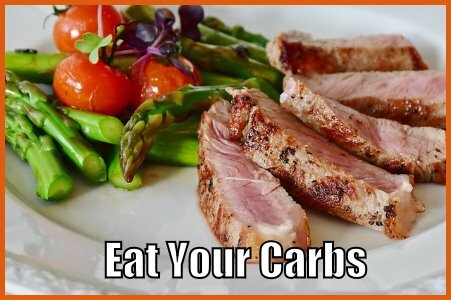 Ultra-Low Carb Transforming Recipes Click Here Now!